My ghost author, Joanna Campbell Slan, is busy getting ready to go to Malice Domesticin Bethesda, MD, and Festival of Mystery in Oakmont, PA. At Malice, she'll moderate one panel and be a participant in another. 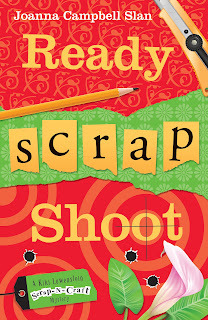 It's been a busy week for her and me with the release of Ready, Scrap, Shoot, the fifth book in my series. I know that Joanna's been thinking about one particular question she'll be asked at Malice, and I wanted to weigh on it because, ahem, it really is all about me. See, the moderator asked Joanna to be thinking about the ways in which I've changed. And golly, don't you know I have? It's been nearly seven years since Paper, Scissors, Death was first written, the first book in my series. Back then, I was the stereotypical stay-at-home soccer mom, who lived in a McMansion in a fancy suburb of St. Louis. Today I'm a widow, working full-time, living in a converted garage, in a quirky suburb of St. Louis. Besides losing my husband, the biggest change has been that I'm gainfully employed, doing something I love. 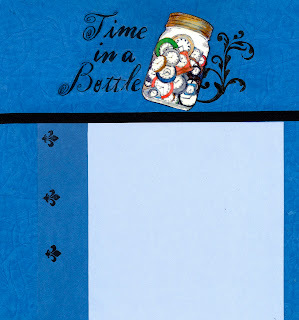 I love Time in a Bottle, the scrapbook store where I work. When Dodie Goldfader offered me the job, I was lost-er than last year's Easter egg. My husband had just died. I was finding out all sorts of unpleasant facts about his life. My whole world had turned upside-down. I didn't know where to start picking up the pieces. Dodie suggested I take it one day at a time, beginning with coming to work with her. Now my life revolves around my daughter, my friends, and the store. What a difference it makes in life to have meaningful work! A reason to get up in the morning. A place to go with people who share your interests. A way to express yourself, to add value in this world, and to make money. I love what I do. I help people preserve their memories, and mainly those are good memories. Sometimes I help them put sad memories to rest. Like when a mother has had a miscarriage or when someone has passed on. Heck, I've even done a divorce album or two. The act of committing your memories to paper can free you to move on. I've seen that happen countless times. Our store is a gathering spot for people. Recently Joanna visited the Paper Niche, a scrapbook store in Davie, Florida. She was struck anew by the camaraderie, by the close friendships the customers had developed. 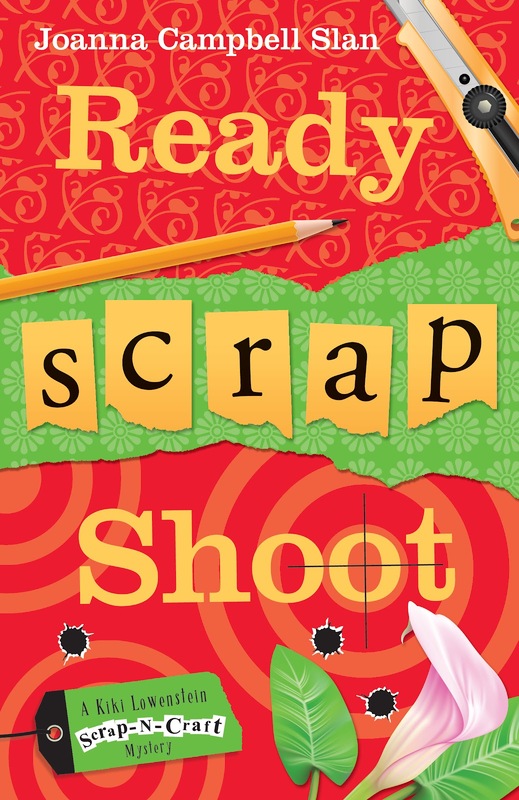 This weekend she'll be at Everything Scrapbooks & Stamps in Lake Worth, Florida. It's her second visit there, and last time she and the women at the store had a blast laughing and learning together. Someday maybe she'll visit Time in a Bottle. When Joanna does, she'll probably find me hunched over a work table, helping a customer save her memories. I think she'll recognize me, even though I've changed. Yes, I've grown as a person. I'm more confident, more assertive, and happier. Some of that is because I'm older, and life has a way of forcing you to grow up. But mainly I think I've changed because I have a wonderful job, and it's brought out the best in me. I know what you mean. I spend my days laughing with other people while we create beautiful things together. But if someone is murdered and the wrong people are accused, we can't help searching for answers--and justice. What a great answer to an interesting question! Our experiences truly shape and change us, don't they? It sounds like you really know yourself and value how you've grown. Good for you! Safe havens are nice, for the time they are allowed us. Enjoy! I'm so pleased that your life has turned out well in spite of the heartbreaks you endured. I hope you'll be sharing more about this Detweiler fellow! I've been reading your story and you've definitely have changed for the better. Kiki I have really enjoyed watching you grow and change over the years. I am also excited about the "new" development. Can't wait to see DeTweiler and Anya's reactions to the news. Thank you Kiki and Joanna, two fabulous women who inspire me. I'm worried about what's going on with Dodie, though; not good. Hi Kiki. I really loved reading this little insight. I do want to know more about how Anya sees her world, poor mum and rich grandmother. You have done such a good job of bringing her up and I am sure that she will adjust after a short time to the 'situation'. It is time that you own Time in a Bottle. Or why not 'come into' some big money..perhaps a last minute charity lottery ticket win...and open your very own shop. I would love that.